Russell Adapter Fitting - Aluminum Fuel Line UNIVERSAL - Dezod Motorsports Inc - Home of the automotive performance enthusiast since 2002. Looking for the right adapters to use with aluminum fuel line? 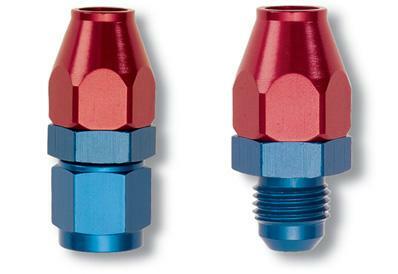 Then look no further than these adapters from Russell. Designed to connect aluminum tubing to -6 or -8 AN adapters, their unique crimp design eliminates the need to flare the tube, thus saving you precious time. They’re available with both male and female ends for 3/8 in. or 1/2 in. diameter tubing.